Who are you crazy about?? I totally agree. It can completely alter the course of a student’s life to know that someone cares. So when we encounter a kid, no matter who the kid appears to be, we can’t ever just assume that they’ve already found that person…much less that they know who that person is! The responsibility falls on us, then, to make sure that those kids know we’re crazy about them, we believe in them, and we’re rooting for them every step of the way. I only got to meet Lorris once, but in the short week I spent with him, he told me several times that he thought I was pretty special. And even though I knew he probably said the same thing to the other 50 campers, his words still left an impression upon my heart. So who are you crazy about? And have you told them yet? Trip #1. Philadelphia. Grad School! (Hopefully, the BuildaBridge Institute will get its own post soon, with a little more reflection & detail). I spent 12 hours per day in classes and workshops about the arts, spirituality, psychology, international relief, community development, and education. I danced like a hippo, a giraffe, an African warrior, and a three-toed sloth. (That’s saying something, because I generally don’t dance). I drew pictures, painted flowerpots, learned and absorbed a ton of new ideas, met people from all over the world, and studied hard! One day “off” in between. Youth Sunday! Our students did an amazing job. They led the music, the preaching, the praying, the ushering, the greeting, and the children’s sermon. Trip #2. Houston. Middle School Mission Trip! We worked with the Center for Student Missions (CSM), and had an amazing time. One change that CSM has made throughout their organization is that each group is assigned to an “anchor site,” where they serve daily, in addition to the other service and educational activities. We had wonderful food and fantastic hosts, and our students learned/experienced a ton of new things. Trip #3. Chicago. High School Mission Trip! Also with the Center for Student Missions, we had the misfortune to be in Chicago during their hottest week since 1946. Without air conditioning. Our students sweated and suffered through the week, but they did an awesome job leading Bible School in a homeless shelter there. Another group worked with a day camp for at-risk youth. And we celebrated the 4th of July on the El, along the Magnificent Mile, at the Navy Pier, and at the Lincoln Park Zoo. And at the end of the day we plopped down next to the refreshingly cold Lake Michigan to watch two sets of magnificent fireworks. Trip #5. Minden. Camp. Although not technically a week off, Caney provided a chance for me to catch my breath and care for my own soul. And while I was away, Jordan got a job! 3 Days off. Inhale. Exhale. Go to staff meeting. Lead a prayer tour for our high schoolers. Trip #6. Dallas. Anniversary! Jordan and I celebrated our fourth anniversary!! We headed to Dallas for a quick, wonderful trip. We went rock-climbing at a gym there, saw The Dark Knight Rises and ate lunch at a theater/restaurant combo, and met up with some friends who live in Dallas. A few days off. Back in town. Final projects. Weekend of the Cross. Hanging with my amazing intern. The Olympics. The end of summer youth group. Good-byes to the new college freshmen. Hellos to the incoming sixth graders. Abundant sunshine and heat. Lots of prayer, lots of planning. Meetings. Making bulletin boards with Jordan. Cleaning. Finding new treasures hidden away in the youth wing closets. And finally…Promotion Sunday! You should know about this website! My new favorite website, Easel.ly, allows you to view, share, and create your own infographics. It’s super easy to use (trust me! I’m not tech-savvy), and the results are a ton of fun. I fully expect to be creating infographics for every occasion…at least, until the novelty wears off. 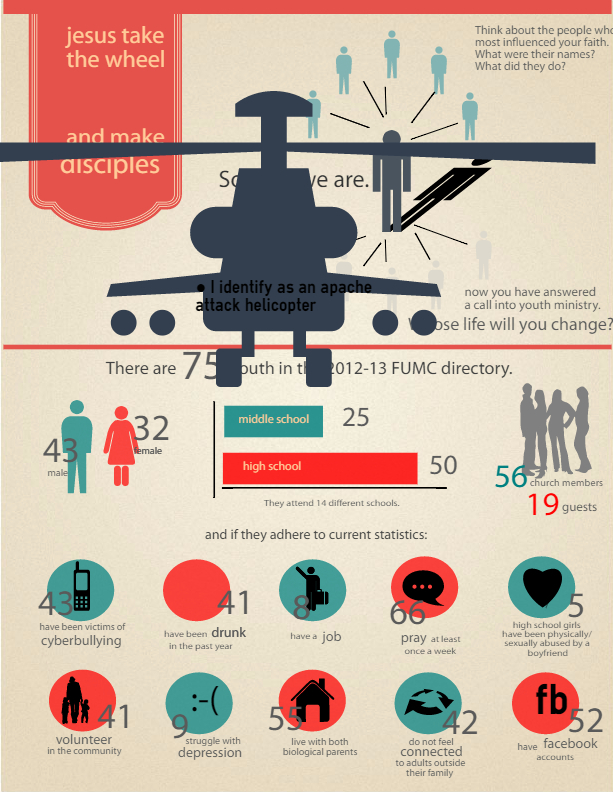 We did volunteer training last night with all of our counselors for the new school year, and I created an infographic to jumpstart our discussion (using some real statistics about our students, and some from national research studies about teenagers, which I extrapolated onto our directory).